Celtics coach Doc Rivers has attributed the team’s defensive woes inside to the absence of Kevin Garnett. It’s less than two weeks before the Celtics take the floor for their first-round playoff series against likely the Knicks or Pacers, and during that time they need to find cohesion. The team decided to rest Kevin Garnett (ankle inflammation) for two weeks, and Paul Pierce also needed a break to rest his gimpy ankle. But sooner or later, the Celtics have to get their core on the floor at the same time, and Sunday night was it. The combination of Pierce and Garnett, with the welcomed help of the resurgent Brandon Bass, led to a 107-96 win over the improving Washington Wizards. If only the shorthanded Celtics had played with the same energy Friday as they did on Sunday, they would have made it easier on themselves in their quest for the sixth seed in the Eastern Conference. This is a critical stretch for the Celtics, who don’t want to match up with the Knicks, winners of 12 straight games after beating Oklahoma City on the road Sunday without Amar’e Stoudemire or Kenyon Martin. Moving up to sixth — they trail Atlanta by 1½ games — likely would set up a first-round series with the Pacers, who were soundly beaten by the Wizards Saturday, and the Thunder the previous night. With five games remaining, the Celtics very much have something to play for besides remaining healthy. They have 10 days to gather cohesion, get Garnett back in premium playing shape, and get accustomed to the big lineup that now features Jeff Green. 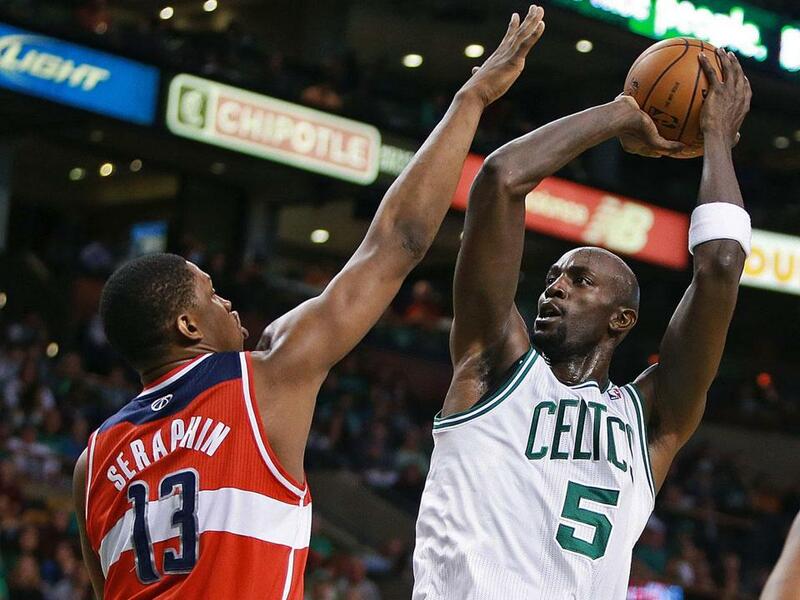 Sunday night was a good start as Garnett looked nimble in his 24 minutes as the Celtics won the rebounding battle, 38-36, as veteran Washington big men Nene and Emeka Okafor combined for just 14 boards and the Wizards scored just 10 second-chance points. Celtics coach Doc Rivers has attributed the team’s defensive woes inside to the absence of Garnett. That’s a lot of pressure to put on the future Hall of Famer, the sole responsibility of the interior defense, and he doesn’t need to be such a force every night at age 36 if Bass, Shavlik Randolph, and Chris Wilcox contribute rebounding. What Garnett does is stabilize the defense. The players feel better when they hear his voice — even the four-letter words — calling out demands, screaming coverages. Washington shot 41.7 percent in the second half, with 13 of its 44 points coming from backup point guard A.J. Price. The prowess was back, but the Celtics have to remain consistent and passionate over these final five games. This is who the Celtics are, a Rajon Rondo-less club that will be spearheaded by Garnett, Pierce, and Green. And it was encouraging that the Celtics scored 107 points and shot nearly 56 percent with Green scoring just 8 points, none in the second half. The Celtics can be a formidable playoff opponent, even for the Knicks, but all of their standouts have to play like standouts. The effect Garnett has on his teammates was apparent. After scrambling for the last couple of weeks because of injuries, the band is back. And the Celtics have to gain chemistry, avoid injuries, and win in the next 10 days to avoid the Knicks. The Celtics are back to normalcy, but that’s when things usually go haywire. This group has to stay focused, consistent, and blend into their roles despite changes around them. When Garnett was playing before his ankle injury, Green was coming off the bench and the Celtics were playing with a smaller lineup. They’re best with a bigger lineup. They are more formidable when Green is on the floor, Pierce is the distributor, and Garnett is getting into the heads of mentally weaker opponents. The resurgence of Bass, who is averaging 16 points and shooting 57.4 percent in the last four games, has been a pleasant surprise. The next 10 days are critical for the Celtics because they have spent 77 games being maddeningly inconsistent and erratic, and they have to embrace good health and all-around production with wins as well as improved cohesion.